We admitted we were powerless over lust—that our lives had become unmanageable. Made a decision to turn our will and our lives over to the care of our Lord and Savior, Jesus Christ. Made a searching and fearless moral inventory of our selves. Admitted to God, to our selves and to another human being the exact nature of our wrongs. Sought through prayer and meditation to improve our relationship with Jesus praying for knowledge of His will for us, and the power to carry that out. 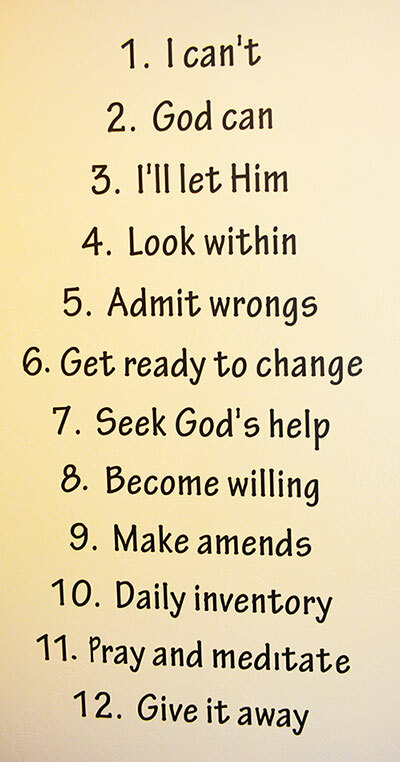 Having had a spiritual awakening as the result of these steps, we tried to carry this message to other lust addicts, and to practice these principles in all our affairs. The Twelve Steps and Twelve Traditions of Alcoholics Anonymous have been reprinted and adapted with the permission of Alcoholics Anonymous World Services, Inc. (“A.A.W.S.”). Permission to reprint and adapt the Twelve Steps and Twelve Traditions does not mean that Alcoholics Anonymous is affiliated with this program. A.A. is a program of recovery from alcoholism only – use of A.A.’s Steps and Traditions or an adapted version of its Steps and Traditions in connection with programs and activities which are patterned after A.A., but which address other problems, or use in any other non-A.A. context, does not imply otherwise. Additionally, while A.A. is a spiritual program, A.A. is not a religious program. Thus, A.A. is not affiliated or allied with any sect, denomination, or specific religious belief.